Get Trained and start executing UFT tests from Jenkins. Click Here for more details. In this post, we will discuss integrating Jenkins CI tool with HP UFT. Jenkins is a CI tool which basically monitors external job executions and it’s mainly used by developers for building and deployment of code. It provides several functions like scheduling of tasks called jobs in several remote machines called as slaves in terms of Jenkins vocabulary. In this post, we are going to learn how to setup Jenkins from scratch for executing UFT automated test cases. First, we need to understand, what is the need for running the automated tests with CI tools? It’s not just applicable for Jenkins, its applicable for any other CI tools or automation tools available in the market. Most of the people are going to tell you about agile and Smoke testing, those are correct and we will go back to this topic in other posts. First, we will look into more common issues which teams will face. I was very happy with learning new languages and implementing new things for my project, and then one day we did some analysis and it seemed that we were spending most of our time in executing older regression test suites and we have only 20-30 % of our time left for development of new test cases, and it’s the problem which was growing day by day more severe. So, the only solution for this problem is to assign the execution of the scripts to the actual owners. It seemed ideal, but in the real world that’s not as easy as we think, everybody has their own tasks to be completed, plus they didn’t have the knowledge for using UFT and you will be pushed back to ground zero, from where you started. On the other side, tests we had were automated test cases, and hence by definition, they are supposed to be run automatically. But due to the manual interventions required due to the nature of scripts or application, it was close to impossible to execute the most of the scripts on a headless remote machine. To resolve these issues we tried HP ALM’s Lab management tool, but I realized very soon that it can only execute the test cases so if you have to execute a bunch of scripts before or after execution of the scripts, you cannot. Also, there is no way to approve the results and a lot of time issues with the remote machine cause the test to fail. There is another way of doing it using Automation Object model, but I really don’t want to take the headache of maintaining another piece of code which might change between versions of UFT. Check your Jenkins workspace path and update if required. Most of them are self-explanatory, but if you need any other details then, Google with the exact name of the plugin. Once, you click on OK button, New Job configuration page will open. This is the main configuration page, where we will provide all of the configuration details about how the Job should execute. 1) Description: Description about the job and the UFT test which is tied to this job. 2) Check on “Restrict where this project can be run” and provide the slave machine name with UFT installed. This is a very important step, because otherwise Jenkins will choose a slave machine randomly, and might choose Jenkins master machine (where Jenkins is installed) for execution. This will cause the job to fail. 3) Select appropriate build triggers, if you are using any source code control for storing UFT tests (Except ALM) e.g. GIT, SVN, TFS. 4) Under Build environment select “delete workspace before build starts”. This will help us in cleaning up the workspace and have a fresh start for each execution. 5) Click on Add build step button under build and select “Execute HP Tests from file system”. This will allow you to execute the tests from file system e.g. “C:\” or network drives. 6) Provide UFT tests or Solution path in the “Tests” text box. If you provide UFT’s solution file path then all tests under solution will be executed one after another. Leave Time out seconds blank. 7) Click on “Add post build action” under post build actions, and select “Publish HP test results”. Select “Always Archive HP test Reports”. This step will generate and archive Junit results for the execution on the Jenkins server, which can be used for analysis. we will discuss this in detail later. 8) If you have configured the email server then Add another post build step and “Editable email notification”. This option will send automated emails after the execution is over. We can attach any files in the email or we can send any files as the part of the email body. After filling out the above information, Click on Save button and start the job by clicking on “Build now” button within job details page. 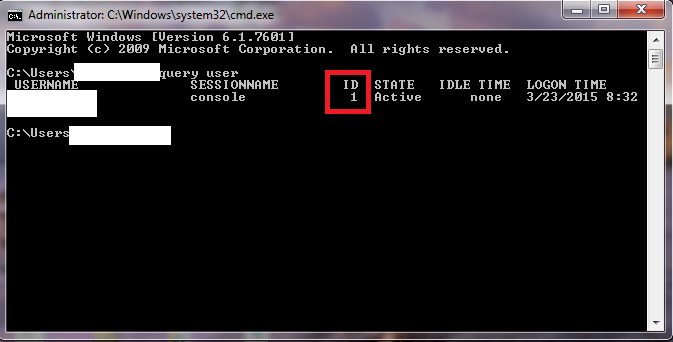 While the test is executing, you can click on Console output, to check the current execution status. This completes the basic configuration of the Jenkins Job. If you execute this line on the slave machine UFT test will execute. 2) LRAnalysisLauncher.exe – For load runner. 3) propsXXXXX.txt – This is the properties file for the HP Automation tools plugin. This will store different parameters required for the execution of UFT/Load tests. 4) ResultsXXXXX.xml – This is the JUnit results generated by the HpToolsLauncher.exe after the execution is completed. When we choose to create a post build step and choose to “Publish HP run results”. This Junit file will be uploaded back to the Jenkins and produce the test results shown in step 12 above. 1) If scripts have any “MsgBox” statement or any “InputBox” statement, scripts will directly fail. 2) If the machine is unlocked, then there is a chance for complex applications to fail. 3) We have to make sure that machine is cleaned up before and after the execution of tests(Closing all browsers and any other types of files like excel sheets or word documents). 4) We have to make sure that UFT scripts have a proper error handling mechanism or UFT will throw an error message and Jenkins Job will fail as soon as Popup appears on the page. 5) If we have a proper framework for our scripts, then most likely we will be executing multiple tests within one UFT test. Because Jenkins HP Automation tool can only count UFT tests and there is no way to indicate no. of tests, if you execute 2 UFT tests having 20 tests each, Jenkins dashboard will only display 2 tests executed, not 40 tests executed. 6) If UFT test report’s a failure in any of the tests, you will see the failure of Jenkins complete Job instead of a particular test case. let’s see how to resolve each of these issues to create a perfect Jenkins job for executing automated UFT tests. We must scan our scripts and replace any statements which require human intervention like MsgBox statements must be commented and should only be used during debugging. For any steps which use Input boxes for accepting inputs, use test parameters and action parameters. For receiving information back, use reporter.reportevent instead of msgbox statements. If we use virtual machines as Jenkins slave machines, then we will have to make sure that the machines are up and running all the time, because virtual machine can go blank without any prior warning, if the user disconnects them. To overcome this issues, if possible change the machine setting, so that machine never locks automatically. But this option is not available in most of the companies because the machines running UFT will most probably have admin rights and it’s not advisable to leave the machine with admin rights unlocked. First test your scripts, if they are able to run in the locked machine. If not then, you can use the following commands to unlock the Physical desktop machine from another computer (In case you are at home or other location). This command will unlock the desktop machine and you can execute your test normally. Machine cleanup framework is explained here. This framework will use the VBScript classes for executing predefined cleanup code. This is required because, if the previous execution of code leaves some things open then, your subsequent executions might fail. Recovery scenarios cannot handle errors properly, for running tests from Jenkins you will need a way to handle all kinds of error, including UFT’s general run error’s. Because, if UFT throws a general run error, then your Jenkins execution will fail, while UFT will be waiting for someone to click on the error and close the test manually and this will create issues with the subsequent test executions. A detailed description of how to implement this framework is explained here. 1) Open the tests and update the Label expression under “Restrict where this project can be run”, with the slave machine name. Once you update the two different tests with different machine names, you can execute the tests in parallel on those two machines (provided you have the proper licenses for executions). 2) Now, the previous method works, but that’s not the best way to execute parallel tests within Jenkins. To implement the second method you will have to figure out the machines with similar properties like “UFT MACHINE WITH IE 8”, so this is a specific machine having UFT installed and can be used for the apps which are only compatible with IE 8. Once you have all the machine characteristics identified you can then open the slave configurations for the machine and update these names in the Slave labels. Once this Logical grouping of the Machines is done then you can provide this logical name with “Restrict where this project can be run”, instead of machine names. Using this method, you wont have to actually remember about the machine names and go through the whole hard process to identifying which machine you should execute the test. One more advantage of this method is if you have two machine with Label “UFT MACHINE WITH IE 8”, and when you execute the test, if the one of the machine is busy, then Jenkins will automatically Pickup the second machine and use it for execution. Jenkins will automatically build the execution queue, once you select more number of jobs then the machines you have. These tests will be executed automatically when the machine will become free. To check this, Update the “Restrict where this project can be run” of three Jobs with the same slave name. Now, click on home page and Click on “Schedule a build” button for all three jobs, one after another and you will see the build queue, on the left side of the home page under “Build queue”. For running tests from ALM, you have to make three changes to the current configuration explained above. 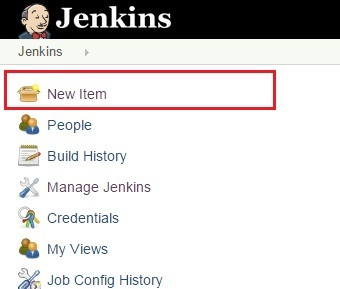 open Jenkins -> Manage Jenkins -> Configure System and find the sub section “Application Lifecycle Management”. Click on “Add ALM Server” button. Provide the server name as Test or Prod or Dev and enter the server URL till qcbin. Click on save and apply. You can add multiple ALM Servers. 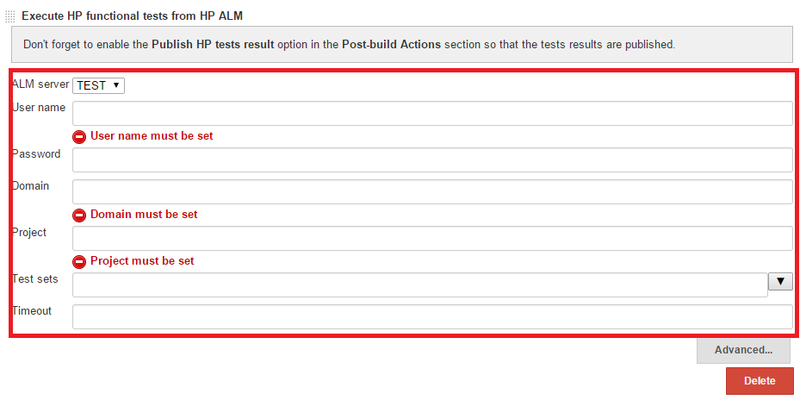 2) Use “Execute HP Functional test from HP ALM” instead of “Execute HP tests from file system”. if you want to execute the tests on specific host defined in ALM. When you execute your tests from ALM Server, you will see one change in the Console output, you will start seeing all of the Reporter.reportevent statements on the Jenkins console log. This feature can be used to check the current progress of the execution. Test execution status will be uploaded automatically to ALM Server. When, one UFT test executes 100 test cases, HP Automation tools plugin will only return either one pass or one fail. To over come this create your own Junit results xml file at runtime after the UFT execution is completed. This will also serve as a checkpoint, if the UFT execution is completed successfully then only we should have a JUnit file generated. 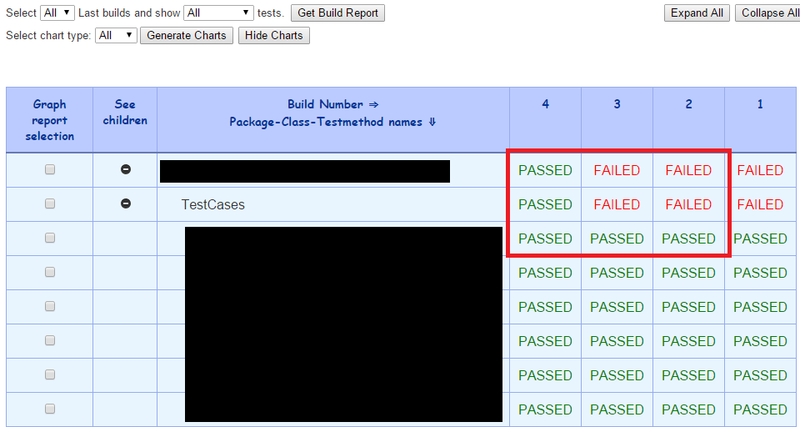 When you publish this file after one UFT test execution you will see two passed test instead of one passed tests. To publish the JUnit results, add the post build step “Publish Junit test result report”. Provide the JUnit file path and enter 1.0 in the Health report amplification factor. After creating this function, on the Jenkins configuration, add a build step “Archive the artifacts”. This is Upload the results back to the Jenkins server and will be visible for each execution. The default Archival path is Jenkins workspace, but we can also point it to the child folder inside jenkins workspace. In addition Upload any artifacts related to the test execution to Jenkins, if required. Once, you have dashboard plugin installed in the Jenkins, create dashboard views and add test execution statistics Grid to it. This will pull the data from the Jobs latest JUnit files and publish the data on the Dashboard page Providing summary on the Dashboard home page. Above is the snippet of the Test execution statistics Grid. Use the flexible publish plugin to figure out things like, if the files are generated before actually passing the Jenkins job or failing the Jenkins Job. One example is check if the Junit results are generate before archiving them to Jenkins server. If the file is absent then Jenkins will throws an error and fail the job. I have included a separate batch file for running the remote agent launcher during each run session and close it after the execution is over. This will make sure that all of the UFT related processes and connection are re-established during each run session. You can use the test result analyzer for analyzing the results of two separate executions. To Open, Click on “Test Result Analyzer” on the job description page. Create a batch file to kill UFT and add this to build step after the step for the execution of the UFT Test. This will make sure that UFT is not hanged in between and also if the Jenkins Job is stopped due to some reason you will have the machine ready for the next one. Let me know, if you have any questions and i will try to resolve them. When i run in UFT 12.02 , i am unable to see the results. Will it support UFT 12.02 with the above steps. Thanks Summet, for the information , can i get some help on junit result generation. As with 12.02 i am not getting uft results/reports. its saying to install later version of uft or run results viewer later version. can i get some help on junit result generation. As with 12.02 i am not getting uft results/reports. I’m unable to run it successfully. Can you please help? Below is the error. Do you see anything executing on screen ? Have u used Inputbox statement in your script ? When u execute the script from UFT what’s the result ? Can u execute a sample UFT script from Jenkins successfully? The same script successfully runs from UFT where as it is unsuccessful in Jenkins. It is not executing anything. When the build is triggered, it fails in couple of seconds. I have tried a new script as well. Still no luck. 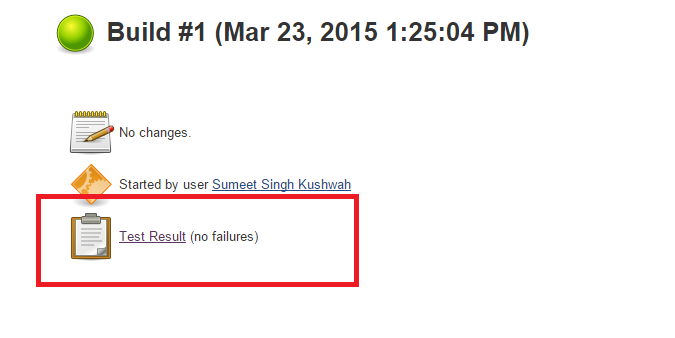 Same behaviour- From UFT it is successfully running whereas it fails in Jenkins with above error. Also I tried to configure Jenkins to run it from ALM. Still no luck. I’m facing the following error. I want to trigger a set of UFT scripts from Jenkins. These same set of scripts have to be executed parallelly on different machines. Is it possible? I want to run a same set of scripts parallely on different machines from Jenkins job. is it possible? Can you please advise how we can I use parameters from propsXXXXX.txt file within UFT code? I don’t think that you can access parameters defined in the propsXXX.txt file in UFT, because they are used by the Jenkins plugin. I will check that tomorrow again. But if you want to pass parameters from Jenkins to UFT then you can use MTBX files for running the tests. Below is the article which explains that procedure. Thanks Sumeet, yeah please check and let me know. Yes i am trying to use the parameter through MTBX file. I’m new to Jenkins and now im doing basic level of execution. And I need your help resolve my issue. I have not opened any excel file and path also correct. How are u starting slave on the slave machine ?? This isn’t slave machine. I’m running from the main machine only(Master). Is creating a jenkins slave compulsory for executing UFT scripts? I am accessing the UFT scripts from ALM. I added the test set names in HPE plugin. But when i run job i am getting below error in console output. hi, I am using UFT, want to Configure my UFT job in Jenkins from my local first, after that will keep in Gits Hub, can u please suggest..
You can use this article for executing tests from Local, after that you can move your tests to GIT, after that you can use https://sumeetkushwah.com/2017/03/13/uft-git-jenkins-integration/ to integrate UFT GIT and Jenkins. As far as I know that’s not possible, because that’s something which should be implemented inside the plugin, which is not done yet. Could you provide more details about how to create custom Junit report so that test result analyzer report can be populated? Check on “Restrict where this project can be run” and provide the slave machine name with UFT installed. This is a very important step, because otherwise Jenkins will choose a slave machine randomly, and might choose Jenkins master machine (where Jenkins is installed) for execution. This will cause the job to fail. I am unable to do parallel execution while “Executing tests from Alm”. Able to execute locally but unable to use option “Run remotely” as it will accept only VDI name not the slave label name. Could you please help me to do parallel run executing from ALM. Note: I have provided the label in slave settings and same is set under “Restrict where this project can be run”. Have you tried running the tests locally, leaving testing tool host blank ? It should start the execution on the slave machine. That way you should be able to achieve the parallel executions. Let me know if you need any other details. We are trying to initiate a build that will trigger UFT automated test cases directly from ALM. We have Master/Slave set up done in Jenkins. We are unable to understand what else should be done to get this fixed. Any help is greatly appreciated ! 1) Is TDConnectivity installed on the Slave machine ? 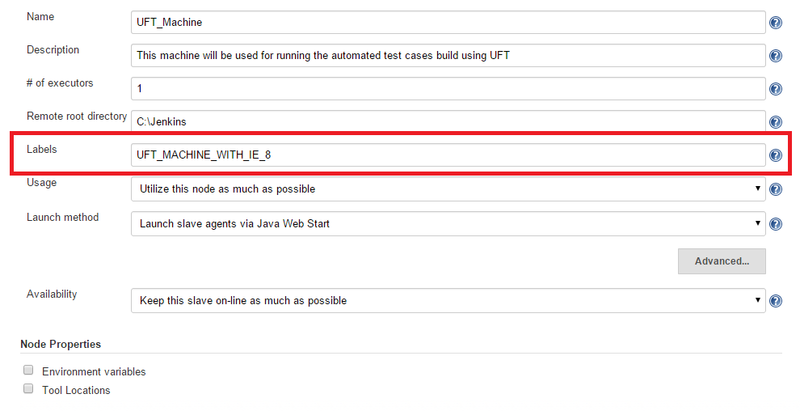 2) Can you run UFT tests from ALM on the slave machine without using Jenkins ? 3) Have you configured UFT to open tests with ALM using Admin rights ? 4) Can you open and login to ALM on the machine ? 5) From the jenkins console if you copy the HPToolsLauncher -paramfile and run it on the slave machine using command prompt, is it starting up the executions ? 6) if you are running jenkins slave as windows service then can you login to the service as your user ID and try running the tests ? thank you for responding. For all 6 questions you asked, the answer is ‘Yes’. Is there any way you can think of something that might be fundamentally wrong in our set up? For my framework, I am reading a InputFile.xls file from ALM resources via a VAPI-XP .vbs driverscript. This DriverScript.vbs reads the input parameters for each test case from the xls, involkes UFT and run the test cases with respective input parameters. Currently I am hardcoding the input file name which is to be read by DriverScript.vbs in the .vbs file itself, and it is running fine.